Sri Lanka is all out for 158 runs. The five times champion are going home early after being knocked out of the Unimoni Asia Cup following their second successive loss. Afghanistan beating them by 91 runs to cement their place in the Super 4 stage along with Bangladesh. This was also Afghanistan's first ever win against Sri Lanka in three outings. They will be playing their last group match against Bangladesh on September 20 which will decide who tops the group. Lanka's 8th wicket falls (A Dananjaya b Mohammad Nabi 2), reach 153 for 8 in 39 overs. Sri Lanka is reduced to 143 for 6 in 35 overs. Skipper Angelo Matthews' patience runs out and he finds Rashid Khan at long-on off Mohammad Nabi. Sri Lanka have been reduced to 116 for 5 in 30 overs. Sri Lanka is at 105 for 4 at the end of 26th over, with Shehan Jayasuriya on 13 not out and Angelo Mathews on 8 not out. Sri Lanka lose their 3rd wicket (MDKJ Perera b Rashid Khan 17) in the 20th over, reach 88 for 3. Sri Lanka reach 59 for 2 in 15 overs. Had lost DM de Silva in the previous over through a run out for 23. Sri Lanka is 28 for 1 at the end of 8th over. 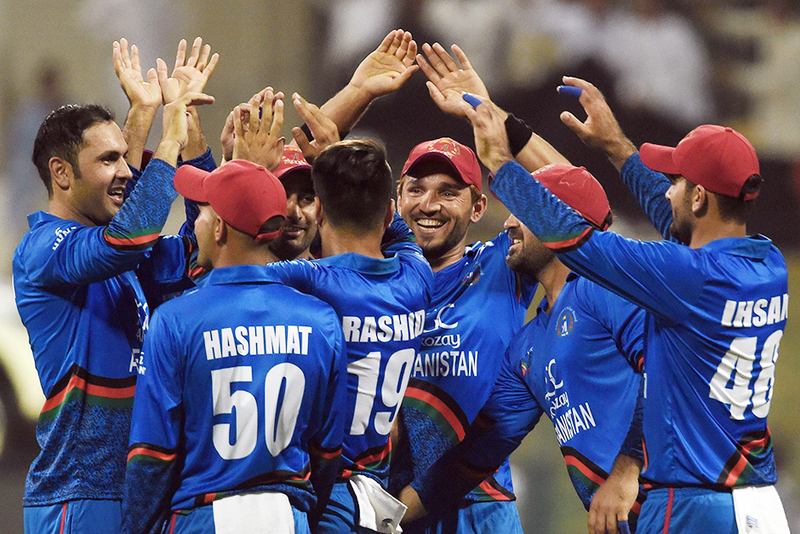 Afghanistan couldn't have asked for a better start, the Lankans are straightaway in troubled waters losing Kusal Mendis in the first over. Mujeeb Ur Rahman trapping him leg before. Innings break: Five times Champion Sri Lanka staring at an early exit have bowled out Aghanistan for a modest total of 249 in 50 overs at the Shaikh Zayed Cricket Stadium. Though it's a gettable target, small totals in pressure matches has often proved tricky and Sri Lankan frontline batsmen will have to show lot of application and spine that they were thoroughly missing in the opener against Bangladesh. Afghanistan has lost 3 wickets in the final over, as Sri Lankan pacer Thisara Perera bagged 5 wickets in total. 7th wicket falls (Najibullah Zadran b NLTC Perera 12) in the 48th over. Afghanistan is 229 for 7 at the end of this over. Afghanistan lose their 6th wicket (ohammad Nabi c NLTC Perera b Malinga 15) in the 47th over, reach 224. 5th wicket falls (Hashmatullah Shahidi b NLTC Perera 37) in the 45th over, and they reach 208 for 5 at the end of this over. 4th wicket falls, Rahmat Shah departs, caught by NLTC Perera and bowled by Chameera for 72 runs in the 42nd over. Afghanistan reach 193 for 4. An excellent partnership between Afghan batsmen Hashmatullah Shahidi and Rahmat Shah is in progress, they have amassed 56 runs in 10 overs. Afghanistan is 166 for 3 at the end of 36th overs. Afghanistan reach 156 for three at the end of 35th over. Rahmat Shah reached his half century too in this over. 3rd wicket falls (Asghar Afghan lbw b Jayasuriya 1), Afghanistan is 113 for 3 at the end of 27th over. Afghanistan lose their 2nd wicket (Ihsanullah lbw b Dananjaya 45) in the 25th over. Afghanistan reach the 100 mark in the 24th over, Ihsanullah is 44 not out, playing with Rahmat Shah at 20 not out. They also a made 50 runs partnership in this over. Earlier, in the 12th over of the innings, Afghanistan had lost their first wicket (Mohammad Shahzad, given lbw to Dananjaya for 34). This being a pressure match for Sri Lanka, runs onboard is always going to be a plus for Afghanistan on a wicket that is expected to slow down as the day progresses. Meanwhile, Sri Lanka, who lost the opening match to Bangladesh by 137 runs in Dubai, brought in spinner Akila Dananjaya, Shehan Jayasriya and Niroshan Dickwella in the three changes from the first game. Out goes Dilruwan Perera, Amila Aponso and Suranga Lakmal.